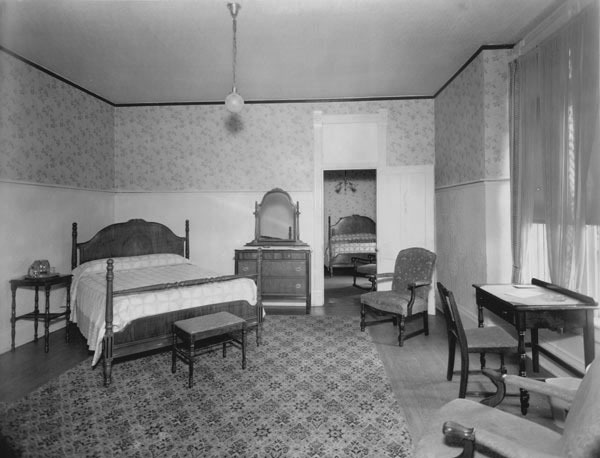 Description: Interior of unidentified hotel, showing adjoining guest bedrooms. Keywords: Business and industry, residences, furniture, bedroom suite, Wichita. Description: Interior of Forum furnished for a ceremonial event, probably for the Order of the Eastern Star. 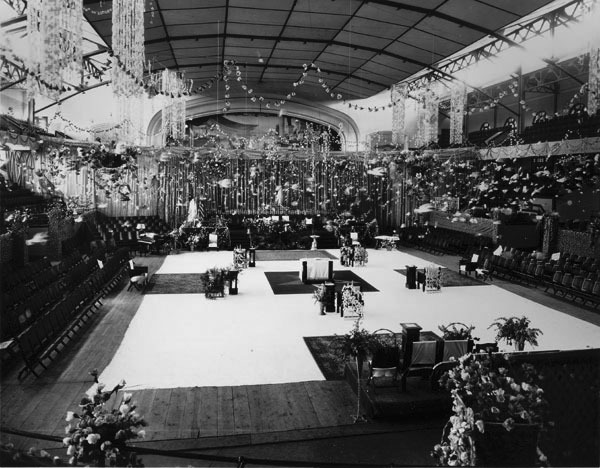 Garlands and cascades of paper flowers hang lavishly from the ceiling; potted plants and floral arrangements have transformed the otherwise plain arena into a festive site. Silhouettes of white [live?] birds appear in motion, flying in a circular direction around the room from right to left. Keywords: Arts and entertainment; organizations, clubs and groups; public events; ceremony; Wichita. 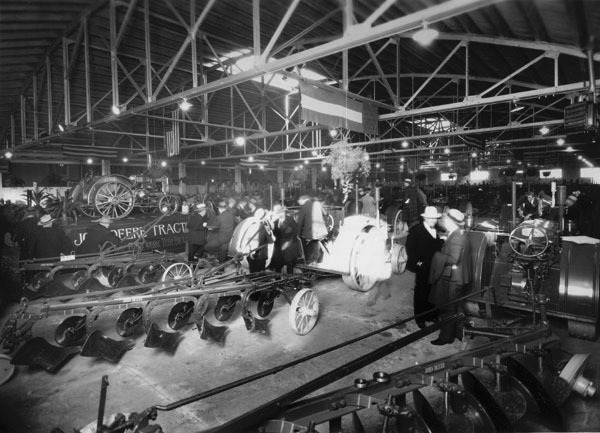 Description: Interior of exposition hall in the Forum complex, 231 South Water Street. The scene is a large display of tractors and farm implements, probably part of an agricultural convention. Keywords: Arts and entertainment, business and industry, public events, transportation, farming, John Deere, Wichita. Description: One of about a dozen Blue Ribbon filling stations operated by the Golden Rule Refining Company. The refinery was located in Wichita and the company was owned by Elbert S. Rule. 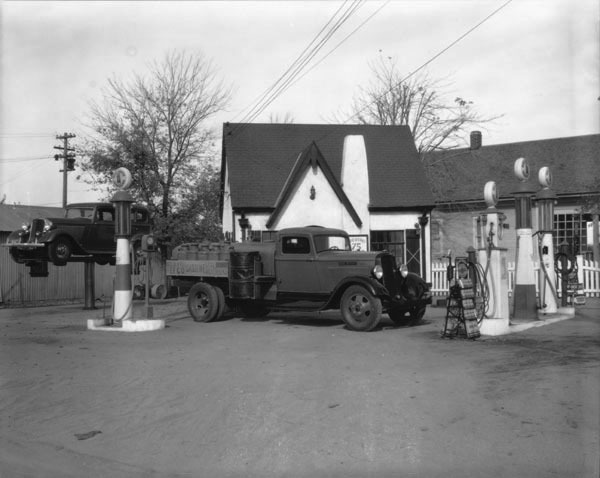 Keywords: Business and industry, transportation, gas station architecture, Tudor Revival, gas pumps, automobiles, Wichita. Description: Looking west at Wichita High School North, 1437 Rochester. Designed by architect Glen H. Thomas, built in 1928-1929; design style is American Art Deco with a Native American and pioneer theme. Narrative sculptural figures were designed by prominent Wichita artist, Bruce Moore. The U-shaped building provided classrooms, a cafeteria, an auditorium with seating for 1500 students, and a gymnasium [A History of Wichita Public School Buildings, 1978, p 189]. Keywords: Education, architecture, North High. 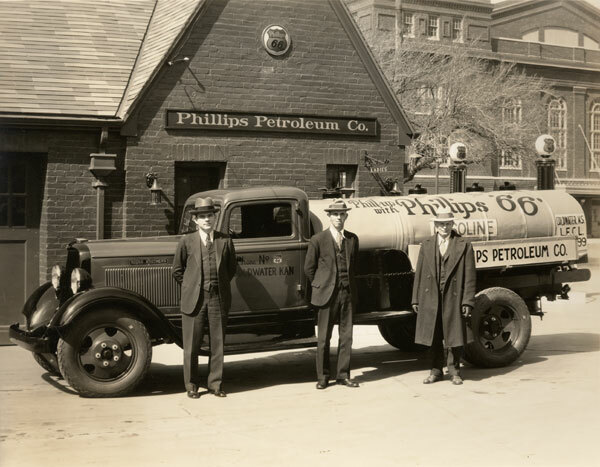 Description: Looking west at the rear driveway of a Phillips Petroleum Company service station (304 South Water Street). The Forum, a venue for community events, is in the background. Keywords: Business and industry, Dodge Brothers trucks, transportation, gasoline tank trucks, Wichita. Description: View of the Maccabees’ building at 144 North Market Street, which housed the meeting rooms of the organization on the second floor and a retail business on the ground floor. The Knights of the Maccabees was an international fraternal and benevolent society founded in Ontario in 1878. 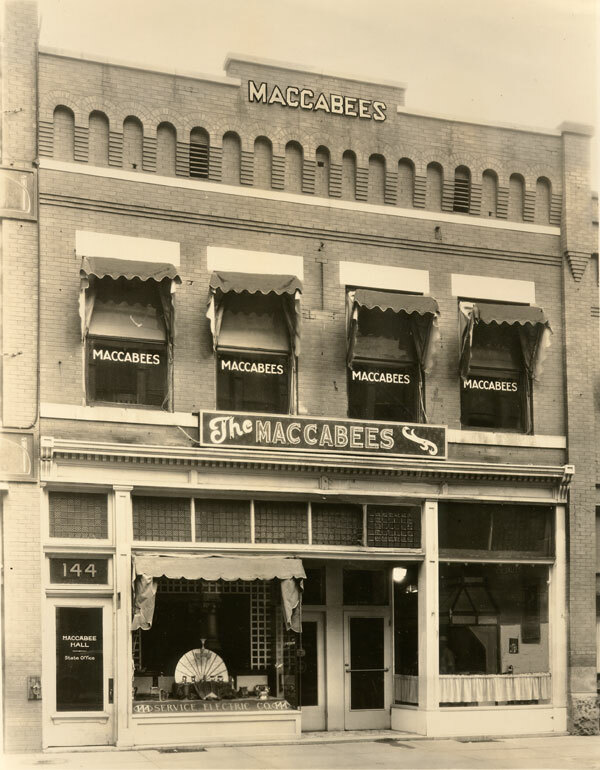 After 1914 it was known simply as the The Maccabees. It provided financial benefits to families of sick or deceased members. It was organized to provide security to working class people who were not generally served by regular insurance companies. However, only white persons of sound health and good character were eligible for membership. Keywords: Organizations, clubs and groups; architecture; business and industry; Wichita. Description: Detail of Wichita High School North Tower. Wichita artist Bruce Moore designed decorative elements of building exterior. 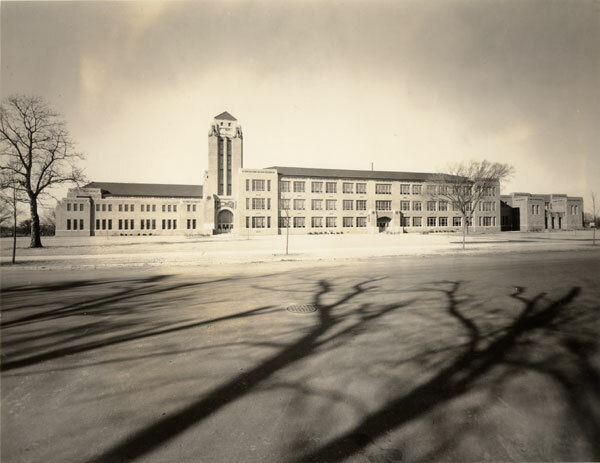 Located at 1437 North Rochester, North High School was opened in 1929. Description: Young women students in Home Economics cooking class. North High School opened in 1929. Keywords: Education, girls, fashion, aprons, yelloware mixing bowl, recipes, kitchen, domestic arts, African American, interior. 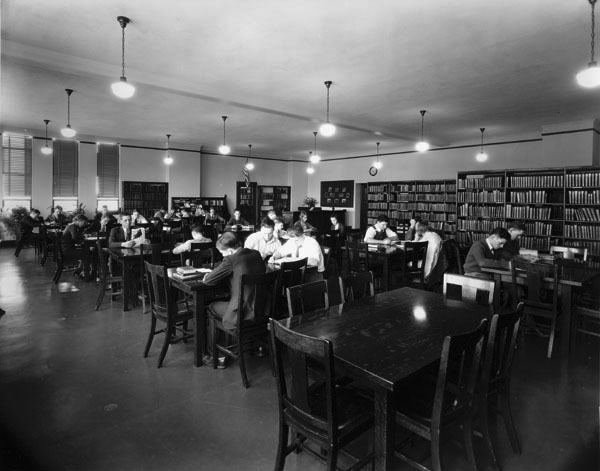 Description: High school students studying in North High library. The school opened in 1929. Keywords: Education, young men, boys, fashion, furniture, interior, American flag, books.